A Florida man who was living in North Tonawanda but went to visit his mother was hit and killed near West Melbourne in May. He was in the bicycle lane when a vehicle swerved into his lane and struck him. The bike was fitted with rear and front lights and would have been clearly visible. The former Canisius High and University at Buffalo football player died due to the injuries he suffered in the hit and run crash. Florida Highway Patrol were able to get a partial license plate number from a witness and they were able to find a 2016 Lexus Infiniti, but it had been abandoned. Unfortunately, hit and run accidents are more common than we’d like to believe. In 2012, there were a whopping 67,968 hit and run accidents that caused 17,000 injuries and 166 fatalities. South Florida accounts for at least one-third of all hit and run accidents in the state of Florida. The reasons people leave the scene of an accident are varied. They might not have realized that they struck something. They could have been intoxicated, or they might be afraid of the ramifications of their actions, especially if someone was injured or died. Regardless of the reason, it isn’t fair to the victims who feel as if they have no option if the driver is never identified. However, even if the driver isn’t found, there can still be damages available to hit and run accident victims. An experienced Florida personal injury attorney will be able to advise you what those options may be. The law in Florida says that if an individual is in an accident that results in property or vehicle damage, they must immediately stop their vehicle and stay at the scene of the accident until they have given authorities appropriate, identifying information. Anyone who has been involved in a crash that resulted in an injury or death is also required to stop immediately and remain at the accident scene until they provide information to the authorities. Identifying information that must be given to law enforcement, as well as other people involved in the accident, include your name, address, driver’s license information, and vehicle registration number. Hit and run accidents often result between a motor vehicle and a pedestrian, but they aren’t just limited to that kind of accident. 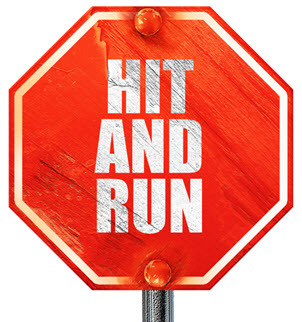 Hit and run accidents can also occur when a driver hits an unattended and parked car and fails to leave the driver of the other car their contact information. Any time there is a collision between two cars, if one of the cars leaves, that driver is guilty of hit and run whether they caused the accident or not. Hit and run collisions can also include motorcycles, bicycles, or any other type of vehicle or party that is on the road. What Are the Options After a Hit and Run? You may still be able to collect compensation from your insurance company even if the other driver is never found. If you have uninsured/underinsured motorist coverage, this protects individuals that are involved in accidents with a driver who doesn’t have coverage or who doesn’t have enough coverage. This coverage also pays damages in the event of a hit and run accident. Working with an insurance company can be complicated. Even though you pay your monthly premiums, they may not want to give you the money that you are entitled to, especially if you are dealing with a hit and run accident. The Boca Raton attorneys at Leifer Law Firm have over a decade of experience helping clients work with their insurance companies after they’ve been in an accident. Contact us today to schedule a consultation at one of our convenient Florida locations.